The Player was a turning point in the career of Robert Altman, a dramatic shift from relative obscurity in the 80’s to a renaissance of great pictures in the 90’s and 00’s comparable to the late career work of Clint Eastwood. It’s no slag on Altman really though, as the cinema of Robert Altman had no real place in the decade of the shitdom that was the 80’s. But Altman was never out of work, in fact, under the radar he produced a number of acclaimed and intriguing works including Tanner ’88, Come Back to the Five and Dime Jimmy Dean, Jimmy Dean and Secret Honor. But in 1992, it was the old Altman, back in the form of his greatest picture Nashville, 17 years prior - a multi-layered multi-character complex story of comedy and tragedy of modern Hollywood movie-making. One of the consistencies of Hollywood over the years has been its ability to self-analyze, critique and satirize itself. From Hollywood Cavalcade, A Star is Born, Sunset Boulevard to the Bad and the Beautiful, Hollywood could always take its own pulse more accurately than anyone else. The Player is as sharp, biting and scathing as all of the above films - mixing some sharply tuned noirish tension with a wicked sense of deadpan comedy. 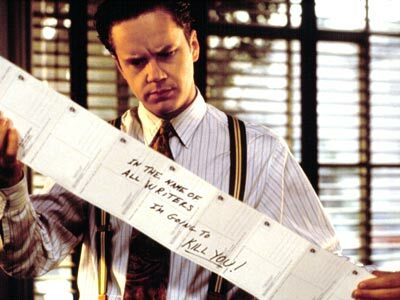 Tim Robbins plays a studio executive Griffin Mill who’s one step away from the chopping block to be replaced by his rival Larry Levy (Peter Gallagher). He’s also being threatened by a disgruntled writer in a series of nasty postcards. When he discovers the whom he thinks is the writer, he confronts him, then accidentally kills him in a heated argument. While covering up the murder he finds himself in the company of the widow, June Gudmundsdottir (Greta Scacchi), whom he slow engages in a relationship with which then becomes a heated affair. But with the cops creeping up on him Griffin also has to negotiate his way out the predicament with his job, evade the cops and reconcile a former relationship with his story editor. The celebrating opening clears off most of the complicated backstory in one remarkable unedited shot, a shot which also references Orson Welles’ grandiose opening in Touch of Evil. It’s one of a series of clever details and Hollywood references which are layered all over this film. Anyone even remotely familiar with how development works will chuckle at the script pitches which continually get thrown at Griffin, even at his worst moments. Tim Robbins’ scattered and aloof performance as Griffin is arguably the best of his career. And the role call of quality cameos and bit players is still astounding. Vincent D’Onofrio’s violent confrontation of Griffin in the parking lot is incredibly tense – some of the best work he’s ever done. Watch out of Whoopi Goldberg’s hilarious performance as the very direct, though affable, police detective. And even her partner, Lyle Lovett who curiously skulks around the scenes is a scene stealer. Great character actors such as Brion James, Fred Ward, Dean Stockwell provide unsung and unflashy supporting performances not to mention Greta Scacchi’s very steamy bit as the alluring yet approachable June Gudmundsdottir. And who could forget Richard E. Grant’s fantastic pitch for 'Habeous Corpus', which would tie the film back on itself so cleverly at the end – an ironic twist which got reused and copied by numerous other films. Altman’s distinct filmmaking style is front and centre, an auteur sensability which links up marvelously with all his other work. His ability to navigate multiple storylines, multiple characters, especially in the same space and same room is thing to behold in this picture. His now legendary techniques of overlapping sound contribute to a truly stereoscopic soundscape of dialogue, music and ambient noise. It’s one of treasures of the 90’s which gets better and better over the years. The Player is available on Blu-Ray from Warner Home Video.